If you know me, you know I'm a little bit obsessed with the Olympics. If you didn't know that, well, now you do. Nice to meet you. For Vancouver 2012 we had an Opening Ceremonies party but the ceremonies were a little dull (though I hope the party wasn't!)... and this year we're not yet at home and the Olympics have begun. So no party... but lots of celebration. Zellers, a Canadian version of Wal-Mart is going out of business (and Target is coming!! ), and so the whole store is on massive blowout sales. Including their Canadian Olympic already-reduced gear. So after speeding driving responsibly to Zellers I returned home with a pair of womens sweatpants ($7.50) and matching ones for my sister, a vintage blue t-shirt ($1.50), and tons of shirts and onsies for the kids ($3 each). I couldn't decide if I went a bit overboard or if I should go back and buy more. Such is my love for all things-Olympic. And hello, did anyone see the opening ceremonies? Amazing. Seriously most entertaining ceremonies I've ever seen! Well done, so far, London. For the next 17 days I'll be glued to the TV taking it all in and cheering for team Canada. My favourite sports to view? 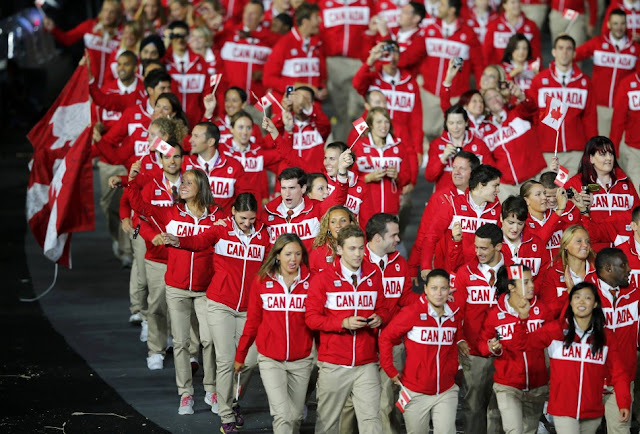 Rowing, Gymnastics, Diving, and Swimming (and anything team Canada has a chance to medal in). Do you get into the Olympics much? What are your favourite sports to watch? Do you ever cheer for a country other than your own? I LOVE the Olympics, too!! !--Though you've got me beat on the Olympic gear ;-) I'm totally bummed because we decided to get rid of cable so I'm missing out! I was able to catch a bit of the opening cermonies, but none of the games yet. I love how the Olympics brings people closer together, it seems as if we're all somewhat cheering each other on! I love watching Diving and Swimming-- I grew up competitive swimming so I love just comparing my times to theirs in awe. love watching the olymipics! it's all so inspiring and totally makes me want to jump on the high bars and do flips on the trampoline but lord knows the 30+ years on this body would make that super difficult! love the ladies gymnastics and swim but its all truly great!